It cannot be said that Krakow’s dining scene lacks Italian cuisine. There are dozens of pizza and pasta places in town, ranging from high quality trattorias to bog-standard imitations with bottles of ketchup on the tables. It seems that even when Indian restaurants open they must, bizarrely, include pizza on the menu to keep everyone happy. Cracovians and tourists alike, it seems, cannot get enough of it. A restaurant that has survived in such a crowded and competitive market since 2003 deserves some attention. 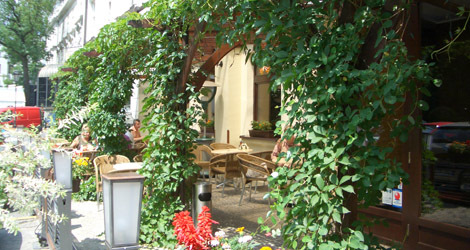 Il Calzone, owned by Artur Schmidt and Marcin Pierożynski, is tucked away behind the Pugetów Palace on ul. Starowiślna in a quiet little courtyard ideal for al fresco eating. The first thing that strikes you is the simplicity of the place. The dining room is compact, with bare brickwork and exposed plaster, a few choice pictures of Italian views, wooden chairs and tables and low lighting. 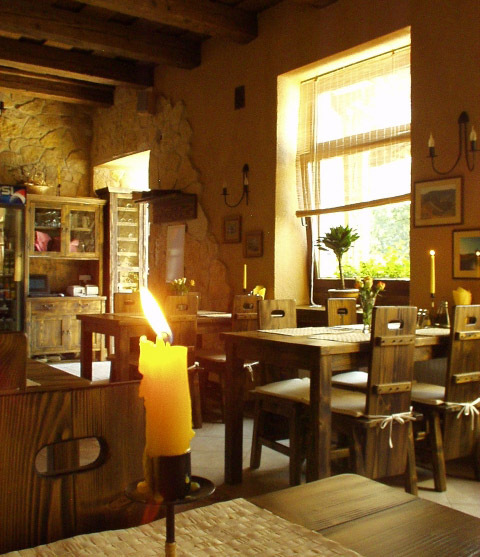 The trattoria feel is immediately welcoming and homely. Having visited on more than one occasion (the first time about eight years ago), I knew that the pizzas were pretty decent, so I decided to explore the menu a bit more fully this time and try some dishes that aren’t ubiquitous around town. The menu is extensive. There are 13 antipasti, 6 salads and 3 soups before you even get to the mains. I went for a couple of starters since they looked so tempting and, at less than 20zł, good value. First was chicken liver in orange and balsamic sauce. The simplicity of this dish is deceptive, but the collision of flavours in the tender meat and bitter-sweet sauce is a thing of wonder. My partner’s grilled slices of goose breast with provolone (Italian sheep’s cheese) and sweet, juicy sultanas were also succulent and delicious. I had a second starter, grilled Camembert wrapped in Parma ham on tomato carpaccio. This was melted to perfection and extremely satisfying, and my only concern was that the portion was so large that I would be too full to enjoy my main. I visited on a Sunday evening, which meant that stocks of seafood were out. Come on Tuesdays or Thursdays to try dishes such as oysters, mussels in mustard sauce or fried scallops with rucola and dried tomato. The owners have taken a great deal of care over their wines, travelling across Italy and Hungary to buy them. There are over 50 wines from the Friuli-Venezia Giuli region of Italy, Eger in Hungary and Brda in Slovenia. Our house red (27zł for 0.5l) was fruity, full-bodied and flavoursome, complementing the meal nicely. Wines are also available for take-out purchase at a 20 per cent discount. There is plenty here for connoisseurs to consider splashing out on. I sidestepped the bewildering list of 30 plus pastas (including ravioli, tortiglioni, gnocchi and lasagne) and the 20-or-so pizzas, and instead went for a meat dish – grilled sirloin steak cooked in a balsamic sauce, medium rare with a side dish of pan-fried potatoes and spinach tossed in butter with fresh parmesan. Overall I found the meat satisfying and tender, and the vegetables well-cooked, but finding the perfect steak in Krakow remains an unfulfilled dream. My partner’s swordfish in a sauce of chopped anchovies and green olives was unusual and tasty, and the grilled vegetables served with it were fresh and crisp. With just enough room to squeeze in a dessert, we went for crème brulee and panacotta respectively, and both were admirable efforts. The creamy panacotta in particular, served with a tangy blackcurrant sauce, was a lovely way to round off the meal. Our waiter, attentive and excellent throughout, could not persuade me to have a coffee, or indeed a wafer-thin mint. Our compliments go to chef Grzegorz Grabos for a more than satisfactory feed. Il Calzone, a veteran on the scene, continues to impress. It has seen off a lot of competition, and will likely continue to do so if it keeps up these high standards. Just don’t think of asking for any extra ketchup or garlic sauce with that pizza. If you’re looking for a steak the you obviously have not made it to Pimiento the Argentinian Grill. If you’re favourite meal is steak then this is a must. Prices may seem steep compared to an Italian restaurant in Krakow but quality costs and yet the steaks here are cheaper and better than many other European cities. The reason why you get pizza offered in Indian restaurants these days is because it is totally hip in India, to eat pizza. Bizzare yes but … hey … that’s the way the cookie crumbles … so to speak ..